What do They Mean and Where are They From? On the morning of 20th August 2001, a new crop formation was found in a wheatfield at Wherwell, a village near Andover, Hampshire. 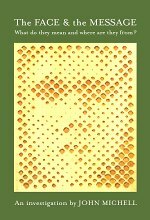 It turned out to be the image of a huge face, made from isolated clumps of standing wheat like half-tone printing dots or computer pixels. Paul Vigay, director of the Independent Research Centre for Unexplained Phenomena, was called in. He is a computer expert, and he quickly identified and decoded the mysterious script. It was, or it pretended to be, a communication from space - a response to radio signals transmitted from earth 27 years earlier. On 16th November 1974 a government-backed group, SETI (Search for Extra-Terrestrial Intelligence), used the giant telescope at the Arecibo Observatory in Puerto Rico to beam a coded radio message into space. The target was the globular star cluster M13 in the constellation of Hercules, 25,000 light years away from us. The message gave technical details about ourselves and our solar system. The apparent reply, expressed in the symbols of the crop formation, gave corresponding data about another inhabited area of the universe. In this pamphlet, John Michell investigates this extraordinary phenomenon, looking at the whole subject of crop circles, their conspiracies and hoaxers, and the possibility that this may be a conspiracy by the phenomenon itself or by the intelligence that directs it. A fascinating and highly provocative piece of detective work, this pamphlet will re-ignite the debate on the mysterious artforms that appear annually in our fields and have never been satisfactorily explained. JOHN MICHELL was editor of the first crop circle magazine, The Cereologist, and has an abiding interest in all strange phenomena, about which he has written several highly respected books. He is also recognised as the world authority on ancient science and religion, and is much quoted as the expert on ancient civilisations and what they reveal to us. This is a guidebook to over 500 places in the British Isles where fairies have actually been seen. Concentrating on places that are identifiable and able to be visited today, the sources drawn on range from traditional folklore to modern first-hand sighting reports. The entries give precise locations, usually including Ordnance Survey map references. All the different types of Little People are represented. They are mostly not the pretty winged fairies that appear in children's picture books. ''Real" fairies can be frightening. By reading these stories and travelling to the fairy sites, the reader will gain a sense of what it is to inhabit that Otherworld of the fairies. This is a call to get up and explore the Fairyland that is all around us. JANET BORD has lived in rural North Wales for the past 30 years and is well known for writing Fairies: Real Encounters with Little People, Mazes and Labyrinths of the World, Footprints in Stone and seventeen further books over a period of 25 years with her husband, Colin Bord. They also created the Fortean Picture Library, a pictorial archive of mysteries and strange phenomena. Essential reading for the Twenty-First Century pilgrim. Recognized as the world authority on ancient science and religion and the symbolism of ancient landscapes, John Michell takes us on an unforgettable journey to ruined abbeys and cathedrals, pagan sites and megalithic temples, shrines of saints and visionaries, holy wells, island sanctuaries, and to a host of other places where peace and sanctity are almost tangible. Some of them are famous, others quiet and secluded, but all are centres of spiritual energy and renewal. We begin in London with the glories of Westminster Abbey, St Paul's Cathedral and all the tiny churches in the City of London. Then on to Canterbury, Durham, Ely and other historic cathedrals; to Glastonbury - 'the holiest ground in England' - where Jesus is said to have visited and Arthur and his queen are buried; to shrines of St Catherine in the south and Saxon lady saints in the Fen Country; to Stonehenge, Avebury and other stone circles; to the holy island of Lindisfarne. With this guide, travellers can trace ancient patterns in the landscape and discover the wisdom of local legend and lore. A fascinating introduction to centuries of history and tradition, it also shows how much of sacred England has survived, remarkably, despite the depredations of time. Over the last 40 years JOHN MICHELL has written more than 22 books. He is certainly no armchair traveller, and has travelled the highways and byways of his native England mainly on foot. He lives in London where he continues to write, tirelessly pioneering new ideas and research. 215 x 110 mm, 712 pages, fully illustrated in black and white with colour codes by province and county, plus user-friendly maps and keys. A guidebook for the traveller who wishes to experience the spirit of this ancient land. Ireland possesses such a vast number of ancient sites that most of them remain unknown and all but forgotten, except by those who live nearby. This book offers directions to some 800 sites in both the North and South. Here are simple wells and stones which are still regarded as places of pilgrimage to the local people. Here also are sites of national importance, holy mountains, lakes and rivers created by giants and protected by fairies, ancient churches, round towers, high crosses and beautiful cathedrals built on sites held sacred for thousand of years. The enigmatic temples from pre-Celtic times, the megalithic monuments we call tombs, are all well covered here with many new insights. Some are internationally important like the complex and magnificent tombs of the Boyne Valley. Others sit alone on wild and windswept hillsides waiting to be discovered. Cary Meehan has explored many such previously uncharted sites and she reveals their secrets in historical and archaeological detail, the legends and folklore as well as the current information on earth energies relating to the sacred nature of these sites. This Guide will enhance the experience of any traveller to the ancient magical land of Ireland. CARY MEEHAN was born and educated in Ireland. She studied archaeology she became interested in the nature of the effect of history and place on the individual psyche. While researching this book she has travelled around Ireland, exploring the imprints of mythology and early history on the landscape. Full colour, A1 landscape size, folded or rolled. This eagerly-awaited map of ancient Glastonbury and its surrounds is unique in that its design is based on ancient and medieval sacred places, ley alignments and the coasts and islands of the Somerset Levels. It highlights the mystical archaeology and ancient history of the area. The map shows ley alignments between sacred sites big and small - hilltops, ancient settlements, hillforts, megalithic remains and medieval churches. It highlights Somerset's hills and the wetlands of the ancient 'Summerlands'. Also featured are the giant effigies of the Glastonbury Zodiac. Glastonbury's spiritual heritage spans 5,000 years and more, embracing the pre-Megalithic, Megalithic, Bronze Age and Celtic-Druidic cultures, Roman and Saxon times, the High Middle Ages, secular urbanism and, today, a New Age subculture. All these features of the Glastonbury 'landscape temple' are written about on the reverse side of the map. It is a map that will draw you in to the magic of the Moors and Levels, the legendary hills and monuments, and it will take you back in time to the Isle of Avalon, when it was surrounded by bogs, marsh and the sea. This isn't just a romantic preoccupation with the past though. As Palden points out in his introduction, studying the patterns of the past will give us new insights into key 21st Century issues: bio-sustainability, food security, climatic re-balancing and re-enchanting humanity and the land with a new magic - a magic which lies at the centre of the solutions we are nowadays challenged to find and bring into being. PALDEN JENKINS has lived and worked in Glastonbury since 1980.